Posted on June 7, 2018 by Emily Allbon. As many of you will know I’ve been on sabbatical for Term 2, doing research and practical work in the area of legal design. This is very much an emerging field and one for which there is increased interest from both a legal practice and access to justice point of view. If you want to know a bit more about it, there’s a short explainer via Legal Geek but really interesting development is going on around how we can communicate the law more effectively as lawyers. 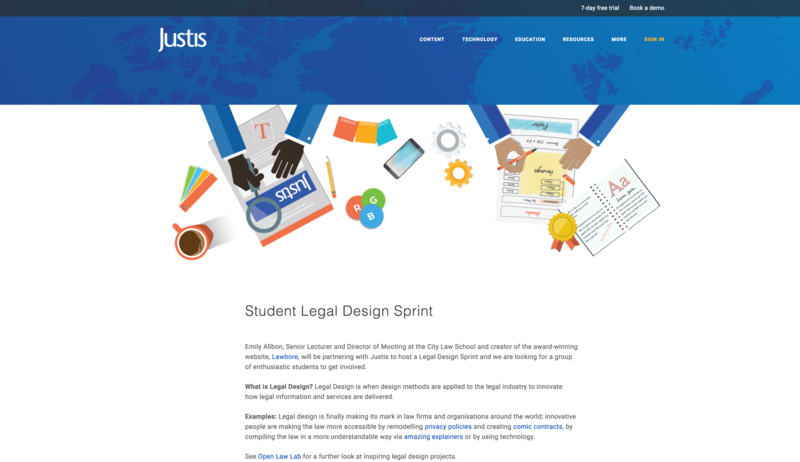 I’ve teamed up with a legal publisher, Justis, to run a Legal Design Sprint over the summer. If you’re interested in taking part please sign up and we’ll send you more information. This isn’t just limited to law students, so if you have friends who study engineering, computing, design or anything related, get them involved too. This would give you an opportunity to explore a new area, get practical experience of working on a team project from start-to-finish, as well as enhance your problem-solving skills. As part of my project I’m also developing a brand-new resource and am looking for any of you who may have some interesting examples of how you use visuals in your revision notes. Perhaps you do little sketches to prompt you to remember cases, or use diagrams, flowcharts? Maybe you design your notes to look particularly attractive, with boxes, colours etc. Please get in touch if this is you! I will then tell you more info individually.